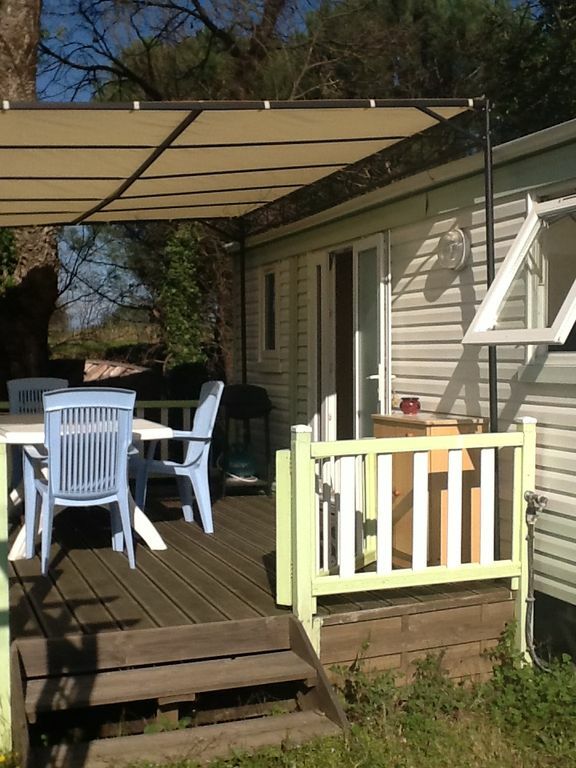 Independent mobile home is located 1.5 km from the center of Cogolin, in the heart of Provence. It is housed within a camping and guests have access to tennis courts and an outdoor pool. Protected by a pergola, the terrace with sun loungers and a barbecue. In addition to a private garden, Mobile home Argentière also has a seating area, flat-screen TV and a private bathroom with a shower. The kitchen of the mobile home is equipped with an oven, microwave and refrigerator. Guests can enjoy meals in the dining area. You'll also enjoy the snack bar and table tennis camping. A parking space will be provided to you and bikes can be rented on site. The property is 6 km from the beaches of Port Grimauld, 12 km from Saint-Tropez and 45 minutes drive from Fréjus Train Station. Un forfait de 30 € sera retenu sur la caution pour les éventuels frais de ménage le jour du départ .